PANAMA CITY, Panama — The Panama Canal is a force in worldwide commerce. It leverages its location at the intersection of two oceans and two continents and is responsible for a total of 15 percent of Panama’s GDP. Its number one customer is the United States. 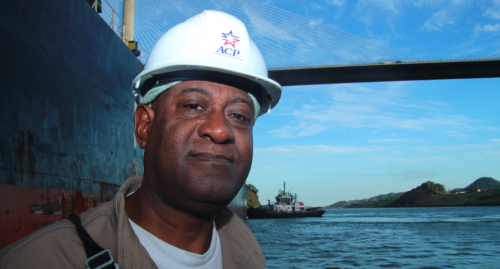 I traversed part of the Panama Canal near its Pacific entrance at Ciudad de Panamá with tug captain Luis Estribi. 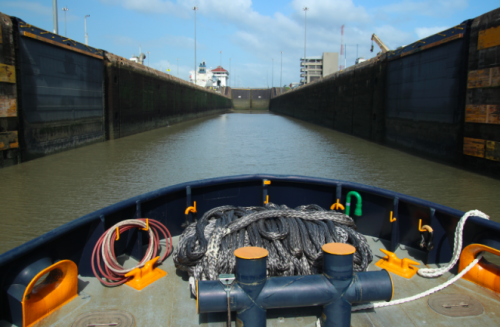 He was guiding a vessel from China— the Tai Prosperity— through the canal’s Pedro Miguel locks as the vessel made its way to the Port of New Orleans. 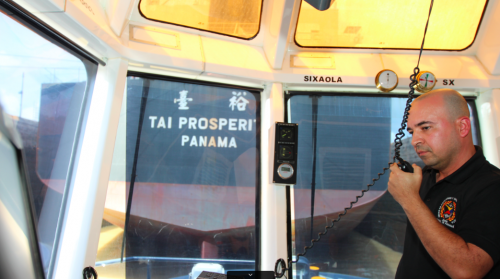 The Tai Prosperity, a carrier of bulk commodities such as grain, is classified as a Panamax ship. Panamax is a worldwide maritime shipping standard measurement that refers to the maximum size vessel that can pass through the canal’s original locks. But today, Panamax is passé. Now it’s all about post-Panamax, vessels that can carry up to three times the cargo as Panamax vessels. But post-Panamax vessels were too wide for the existing Panama Canal. The U.S. Army Corps of Engineers says post-Panamax ships now carry 45 percent of the world’s cargo. But the Corps also says that by 2030, post-Panamax vessels will account for 60 percent of the world’s container shipping. 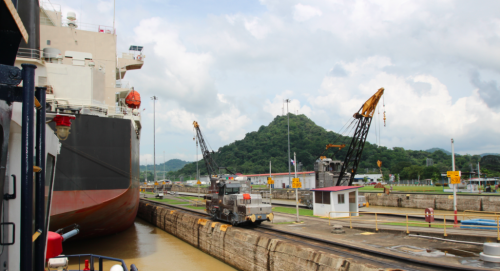 The Panama Canal needed wider and deeper locks to remain commercially relevant. Following a 2006 referendum by the Panamanian people approving the construction of post-Panamax locks, the project has seen multiple delays, legal disputes and huge cost overruns. “The project has been challenged in all senses, with the contractors, legal issues, claims, but I mean, we are moving forward,” said Oscar Bazan, Executive Vice President of Business Development at the Panama Canal Authority, known by its Spanish acronym ACP (Autoridad del Canal de Panamá). That is something that tug captain Lew Stabler says should have taken place years ago. Stabler was born in the Canal Zone that the U.S. ceded to Panama as part of the Torrijos-Carter Treaty, also known as the Panama Canal Treaty. The canal was jointly run by Panama and the U.S. until Panama took full control on December 31, 1999. “You’re talking about a drop in shipping costs equal to about three percent of the market value of the product. That’s big,” said Maurer. He also projected that the cost of shipping coal to China for electrical generation there will fall by approximately $10 per ton. However Maurer said that perhaps the biggest winner in the short term will be U.S. agribusiness. “American cotton and grain that is currently not competitive in Asian markets will become competitive. So for American agriculture, that is a big deal,” he said. Estribi and other captains are looking forward to training in the new locks. The union representing tug captains and deckhands, known by its Spanish acronym UCOC, has claimed repeatedly that it has not received sufficient training. The ACP has denied that claim, saying that some training has taken place in simulators. That ideological battle in Panama is a footnote for senior managers of U.S. east coast ports and the rail that services those ports. Many of those executives have said previously that they are crafting revised economic models based on the the new locks becoming operational. This entry was posted in KRTS News and tagged Commerce, Economy, Free Trade, Fronteras Desk, International Trade, Latin America, Oil and Gas, Panama Canal, Panama Canal Expansion, Texas Economy. Bookmark the permalink.